Carl von Clausewitz is best known for his magnum opus, On War, which has long been considered the standard for Western thought on war and strategy. Although generations of graduate and war college students have grappled with his philosophical look at war, what may not be as well known is that Clausewitz was a keen student of history. He strongly believed that the study of history was key to understanding warfare, not just in a general sense, but as a practical model through which to test the theories he proposed and dissected in On War. 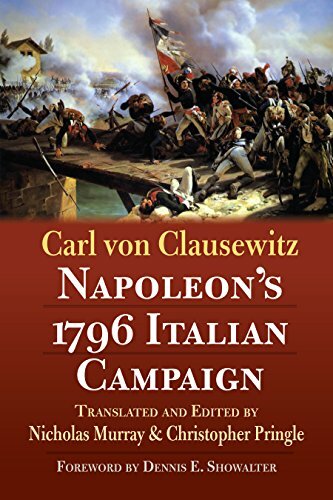 This book examines Napoleon’s first major campaign, a remarkable series of battles, marches, and counter marches throughout Northern Italy in 1796–1797 to secure the southern French coast, challenge Austrian dominance among the patchwork of principalities of northern Italy, and quickly defeat the Italian allies of Austria in order to force them into an armistice with France. The campaign has been considered an operational masterpiece and catapulted Napoleon into the leadership of the French Revolution, serving as the stepping stone to his rise to become the Emperor of France. Clausewitz does not write a mere “drums and muskets” recounting of battles and marches, but rather offers his campaign analysis of the various courses of action and decisions made by Napoleon and his opponents, testing some of his own theories from On War under actual wartime circumstances. Clausewitz had a unique perspective as a historian, having served in the Napoleonic Wars, observing firsthand the profound changes to war, diplomacy, and politics from the French levée en masse of citizen armies and Napoleon’s new operational methods. Napoleon completely overturned the old European model of positional warfare in favor of seeking decisive battle to quickly destroy the opposing army and bring about a quick political settlement. The translation is excellently done, with copious footnotes and annotations by the authors on their reasoning for choosing certain English translations for Clausewitz’s strategic thinking, particularly his major themes such as the schwerpunkt, or center of gravity, a term he frequently used to describe the concentration of forces for an attack that have long been debated among Clausewitz scholars. The authors also use additional primary and secondary sources to tell “the rest of the story,” filling in gaps and errors in Clausewitz’s original reconstruction of battles and maneuvers due to his lack of other contemporary sources. As part of the annotations, the authors also provide the 18th century commentary from a contemporary translation. Finally, throughout the book, the footnotes make frequent reference to the relevant sections of On War directly related to the analytic point Clausewitz is attempt to argue, making this an excellent companion case study. These notes are a definite must read on nearly every page even though they can break up the narrative flow, and each page almost requires reading twice to digest the narrative, footnotes, and analysis. In addition to the thoughtful tie-in between this book and On War, the authors also highlight Clausewitz’s analysis of Napoleon’s operational art of war. Napoleon inaugurated the modern era of the decisive battle, eschewing the traditional European art of war by maneuver when actual battles were considered too risky and costly, even for the victors. In his analysis of Napoleon’s maneuvering during the three campaigns around Mantua in the fall of 1796, Clausewitz in particular conducts an insightful and sometimes critical analysis of Napoleon’s use of the “central position” to defeat a numerically superior Austrian army by placing his army between their left and right wings and defeating them in detail. Throughout the book, Clausewitz also takes an unprecedented (for the time) dive into the diplomatic and political aspects of the campaign, and the genesis of his famous “trinity” of the people, government, and army as the triad for understanding war can be seen in the comprehensive analysis he offers after each phase of the campaign. Finally, on a lighter note, the ongoing rivalry between Clausewitz and his French rival Antoine-Henri Jomini, who penned the major competitive book to On War and who debated Clausewitz’s theories long after the Prussian’s death in 1831, plays out throughout the book, starting on the very first page. For any student who has suffered through comparing and contrasting the theories of these two legendary thinkers, it is amusing to read the 19th century equivalent of throwing shade between these philosophical rivals. This volume is an excellent companion to On War. It can be challenging to read, and takes time to digest, but for anyone wanting to understand how history, strategy, and political science interact in Clausewitz’s master work, this is an outstanding example of these ideas examined under actual wartime conditions.